Very soon nicknamed the 'Filing Cabinet', this award winning building is the biggest court complex to be built in the UK since the Royal Courts of Justice in London. The 16 storey centre comprises 47 court rooms, tribunal and hearing rooms plus offices and facilities for judges. Designed by architect Denton Corker Marshall, it features an 11-storey atrium and a spectacular 63m by 60m cavity glass wall along its western edge. Sixty metre high triangular atrium columns support the glass façade, all suspended from the atrium roof. Equally complex are the floors, cantilevering 15m from the building's columns. In order to meet the requirement for natural ventilation, the structure had to be designed to accommodate a complex web of ductwork to allow air taken in at the sides of the atrium - through wind scoops facing the direction of the prevailing wind - to circulate through the building. An intelligent building management system brings in a back-up forced ventilation system if the wind speed is too low to achieve this. 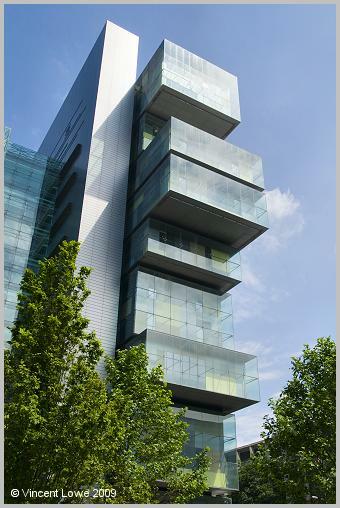 Other features include an 'environmental veil' on the east façade to control solar gain and maximise natural daylight, and groundwater cooling which reduces cooling load energy consumption by around 15-20%.